Plasticolor Car Mats Makes Your Favorite Sports, Cartoon & Racing Logo Car Mats. Plasticolor Car Mats is a family owned business that has been supplying a wide range of useful, colorful, logo based automotive aftermarket parts for the last 40 years or so. You'd recognize their products because you see them at big retailers like Walmart, K-Mart, AutoZone, Target, Pep Boys and lots more automotive supply retailers. 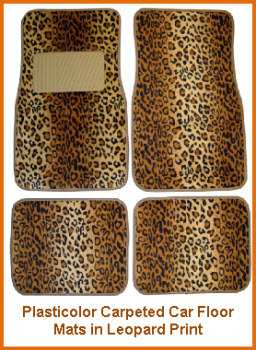 Besides car floor mats you'll also find Plasticolor making steering wheel covers, utility mats, sun visor covers and other auto interior products at their Chroma Graphics Inc subsidiary. 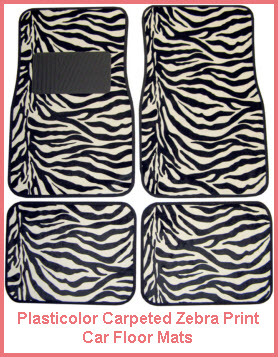 But let's take a look at some of the Plasticolor Car Mats and get some info on them. OOOOOhhhhhh and by the way, if you want to buy some of these mats direct from Plasticolor - here's MyCoolCarStuff. And whooaa ... if Plasticolor doesn't have everything you want in a Logo Mat for your vehicle take a look at our Universal Logo Mats page. Tip: these mats are beautifully colored and great to look at on the floor of your car. Keep them looking good (and keep water that stays on the surface or accumulates between these mats and your vehicles carpet) with a universal absorbent car mat protector. It will also help reduce molds and mildews that grow between your mats and the carpeting when that area gets wet. Plasticolor even makes carpeted floor mats with a couple of different logos for those of you who want the plush feel of a high quality nylon carpet under your feet. Forty years in the business of bringing great brand names and their logos into your car on a floor mat, steering wheel cover, seat cover or other decorative item has made Plasticolor the market leader in licensed automotive accessories. Here's a bunch of the brands you might find adorning a Plasticolor product. Plasticolor's Vinyl Mats that are so colorful and exciting are made from Plastisol. It's a liquid form of vinyl that's cured by heat to form a solid end product. Plastisol is used in all kinds of applications ranging from Adult Toys to Car Accessories to Boat Anchors. You can make Plastisol in all kinds of colors and shapes. It's flexible, UV and mildew resistant, weathers well and can even be made flame retardant. So you get a bit of technology in every Plasticolor Mat you buy. Wanna see more info on Plastisol - here's a plastisol manufacturer.